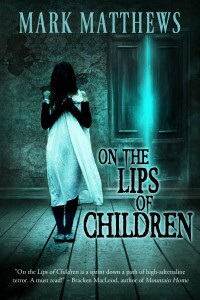 On the Lips of Children was not what I expected at all. Since reading one of Mr. Matthew's previous books, "Stray", way back when I first got my Kindle, I've been meaning to read more of his work. When he offered a free copy of this book, in exchange for an honest review, I said yes. I'm glad I did! "Stray" was a good read but this novella (short novel?) is more up my alley as I am a horror-lovin' gal. This was an imaginative story. The general subject matter, (I won't be any more specific than that for fear of spoiling something), has been done before. However, Mr. Matthew's characterization is what sets this book apart. From the lead character's inner thoughts while running, to their inner thoughts regarding what happened to them later...they all rang true to me. The atmosphere in this one was dark-I loved the building sense of dread and tension that I felt. I didn't think the author would be able to keep that sense of tension throughout, but in the end, I have to admit that he did. Lastly, this book was pretty gruesome. In fact, that may be an understatement. It's nothing a seasoned horror fan would be disturbed to see, but if you're not a regular reader of the genre, the details involved here may disturb you. All in all, I loved this story. Recommended for fans of horror and dark fiction!